Although considered by many to be too small to suit the demands of self-defense, many people still favor the 32 ACP for how compact and concealable weapons chambered for it are as well as the relatively low recoil the caliber offers. Whether you prefer the 32 ACP for protection, or simply have one in your collection that needs to spend some time with you at the range, 1,000 of these rounds by GECO are certain to keep you very busy. 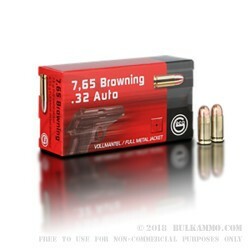 This round’s 73 grain bullet sports a full metal jacket, so it will keep your aim accurate for longer in between cleanings than if you were to fire lead bullets. Its round nose shape makes it excel in close range situations, and causes it to deliver superior impact energy. This cartridge’s non-corrosive Boxer primed casing is brass and brand new from the factory, so a handloader will be well supplied with this purchase. GECO is headquartered in Europe, and spends admirable attention to quality control and innovating their ammunition production technologies. This cartridge is a great example of their fine work.